Members of the honor guard carry the flag-draped casket of George H.W. Bush out during the 41st president’s state funeral at the National Cathedral Wednesday. It was a moving experience to watch the television coverage, with the magnificent sunset in Washington as former president George H.W. Bush’s casket was carried up the steps of the Capitol rotunda. While most of the country was grieving the loss of a war hero and statesman, the Globe’s Adrian Walker (“Complicated legacy,” Metro, Dec. 3) and Joan Vennochi (“When Willie Horton was Dukakis’s running mate,” Opinion, Dec. 4) chose this time to point out the 41st president’s shortcomings. 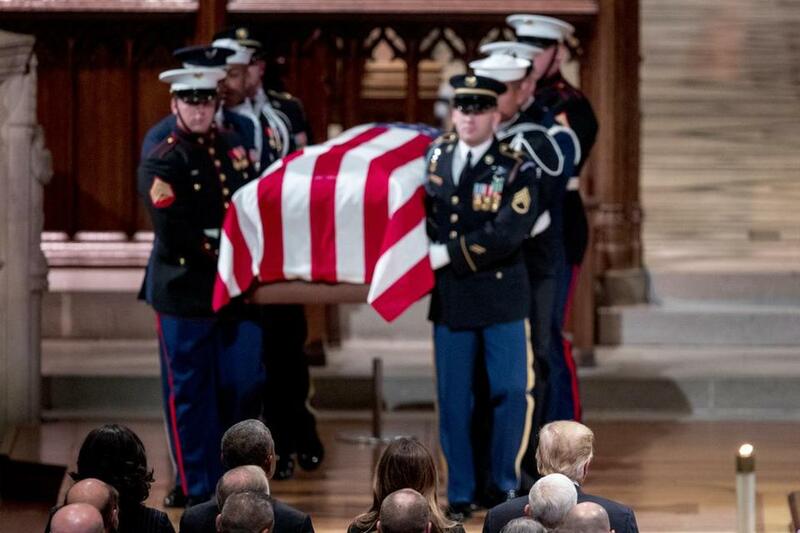 This is a prime example of Shakespeare’s Marc Antony speech at Caesar’s funeral: “The evil that men do lives after them; the good is oft interred with their bones.” Bush is one of only 12 former presidents to have the honor to lie in state in our nation’s Capitol. Perhaps Walker and Vennochi could have waited at least until President Bush was buried. Joan Vennochi’s column about George H.W. Bush was tasteless in this time of sadess. He was a gentleman, a family man, and a statesman the likes of which seems to have vanished, most especially in the political world. Many thanks to Adrian Walker for his column “Complicated legacy,” which lets some of the hot air out of the Bush canonization balloon. As the father of a US Marine who invaded Kuwait in the first Gulf War of 1990-91, and as an antiwar activist with the Military Families Support Network, I cannot forgive the way the Bush administration stumbled into war in the Middle East and destabilization that persists to this day. Particularly galling was the president buzzing around off Kennebunkport in his gas-guzzling speedboat while American GIs were sweltering in the desert to assert America’s interest in Middle Eastern oil. Adrian Walker reminds us of the darker side of Bush 41. Everything Walker writes is true, but beyond that, I’d like to bear witness to the character of the man George H.W. Bush beat in 1988. Michael Dukakis would also have been a fine president — just as honest, just as humble, just as decent as Bush. What’s more, I doubt he would have agreed to use a Willie Horton-style ad against an adversary, and he never would have saddled us with Clarence Thomas on the Supreme Court.